Life is full of ‘bad days’ – if you think you’re having one of them, or even a calendar full of them, this book might help to put things into perspective. It’s a portrait of a lady whose days are potholed with treachery from the moment she’s born. 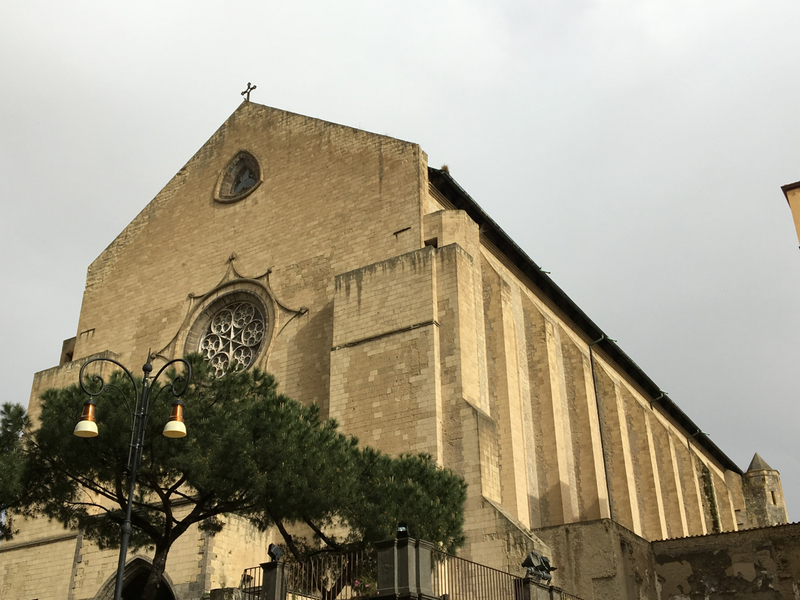 I read this book whilst in Naples, not far from the solid black towers of Castel Nuovo, or il Maschio Angioino (the Angevin Keep), where Queen Joanna (born in 1326 – died in 1382), spends much of her life. 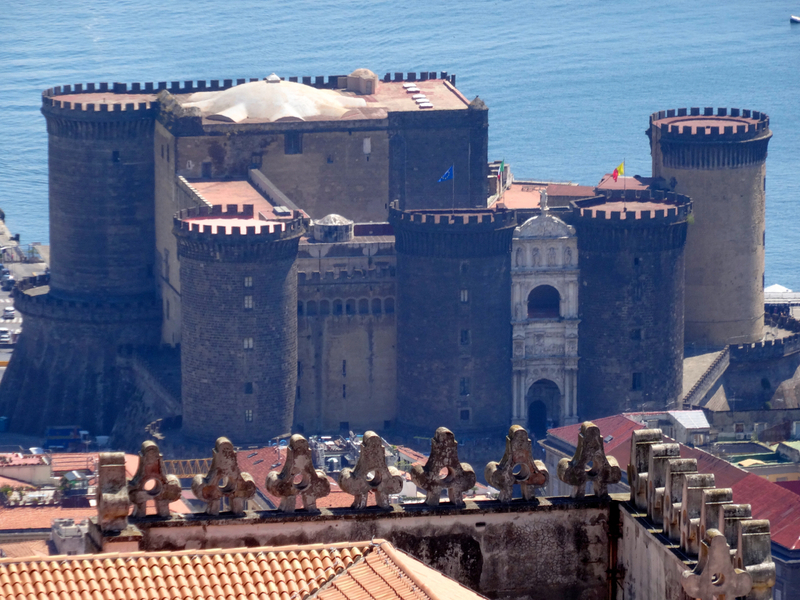 The castle, bulky and unafraid, was built by Joanna’s great-grandfather, Charles I, who was the first of the Angevin rulers in Naples. Along one front is Vesuvius and the sea, whilst to the rear the watchful city of Naples layers up the ridges behind. 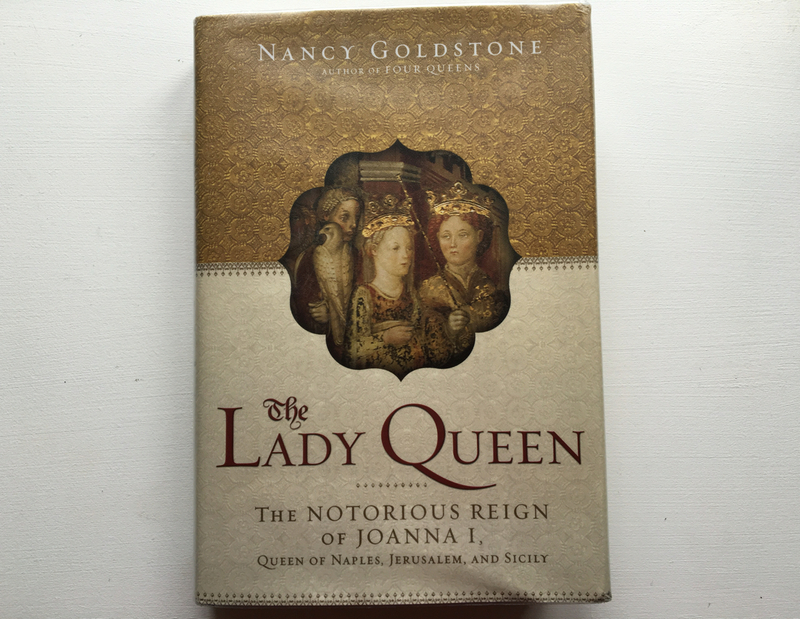 Nancy Goldstone’s The Lady Queen focuses on the life of Joanna, one of the few female monarchs ever to have ruled in her own right in masculine, medieval Europe. To give a taste of the personalities and context covered by the book it takes only a nervous glance at Joanna’s early years to realise that the chapters that remain will rip from one moment of mayhem to the next. Joanna is born in 1326, the daughter of Charles, duke of Calabria, heir to Robert the Wise, King of Naples. Her father dies when she is two and her mother is pregnant with Maria, the only one of her siblings to survive. Three years later her mother also dies and responsibility for her and her little sister passes to their grandfather, King Robert, and his second wife, the very religious Sancia. Home is Castel Nuovo and trouble is all around. 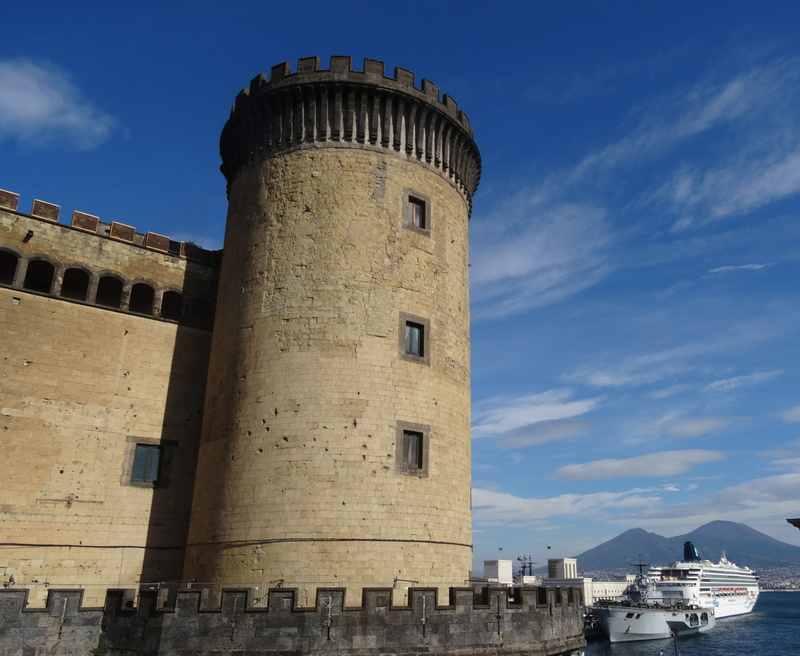 Naples is by then one of only four European cities to have a population of over 100,000, and it’s not easy to rule. If anything its potential and its strategic importance make it one of the most desirable prizes in Europe. A fine inheritance perhaps but not easy if you’re female and only four when your grandfather announces to the world that when he dies his illustrious kingdom will be yours. 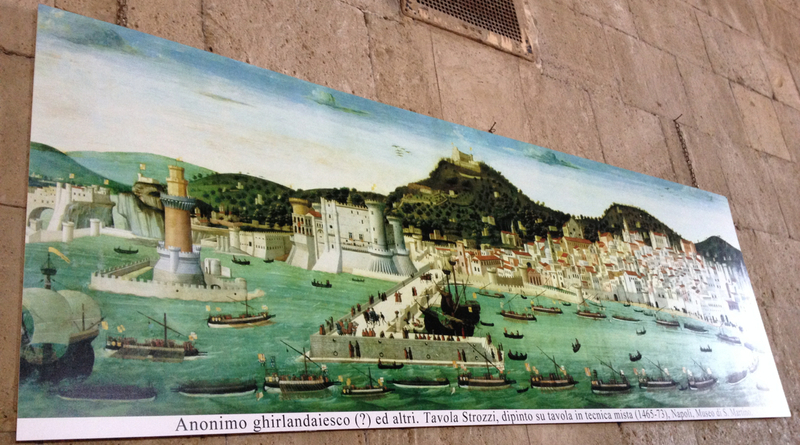 King Robert declares this news at Castel Nuovo, on November 4, 1330, and it causes uproar. Carobert, the King of Hungary is especially unhappy as he feels his claim to the throne of Naples is stronger than Joanna’s as his father was King Robert’s oldest brother. The Hungarians have a point, by birth order and bloodline at least, although none at all by the wishes of either King Robert or his father before him. That last fact though does not stop the agitation. The dangers are obvious and they’re close enough to alarm the pope. Eventually a diplomatic side-step is taken – Joanna, aged seven, is married in Santa Chiara in Naples to the six-year-old Hungarian, Prince Andrew. King Robert makes clear that the bridegroom will never be king himself but does agree that the couple’s oldest surviving child can inherit the kingdom from Joanna. It’s complicated but manageable … whilst Robert lives. But he can’t live forever … a little over twelve years later King Robert dies and the troubles rush in. Joanna, surrounded by plotters, is just seventeen and her step-grandmother Sancia is too caught up in the Church to provide much protection. Within three years the first of Joanna’s four husbands, Andrew of Hungary, is dead, murdered by unknown attackers, and the pregnant young queen discovers that she is amongst the prime suspects. Incredibly the story gets worse. This book is so packed with trauma and intrigue that it’s hard to believe it’s true. Detail and drama fill the pages but somehow the spotlight remains focused on Joanna – on her courage, her good works, and her diplomatic skills – all of which are taken to the brink by her proud, insatiable cousins. In the end, after years of success and disaster, Joanna is assassinated in 1382. She’s in her mid-fifties and, despite unspeakable odds, has ruled for nearly forty years as the first Queen of Naples, Jerusalem and Sicily … and she did make a difference. There are cruelties at every turn in this tale but perhaps the most enduring is that, still today or at least in 2009 when this book was published, Joanna’s bones lie unrecognised at the bottom of a well in Santa Chiara, the church where she was married off as a child. I highly recommend The Lady Queen. It is an impelling, unmissable read peopled with more Durazzos and Tarantos than are easily digestible but well worth the effort particularly if you have a taste for high-stakes drama, and an interest in history, Naples, or the role of women in either. In the short clip below the author, Nancy Goldstone, talks about the book. This entry was posted in Books, Books on Italy, Italy, Non-fiction, Reviews and tagged Angevins, Italy, Joanna I, medieval queen, Nancy Goldstone, Naples, Queen of Naples Jerusalem and Sicily. Bookmark the permalink. ← Lago di Patria: a walk for the dog?